When I was in Beijing I decided to try and eat some “real” Chinese food as opposed to the stuff in the hotels and tourist joints. In one of the guide books I spotted a suggestion for a cheap food court downtown where you can try and bunch of different dishes from different cooking traditions. So off I went. It was great, despite the fact that the menus and adverts were all in Chinese with no English translation. So I walked around and pointed at things that looked good (eg, not the skinned bullfrogs). I had some great food, learned to eat fried egg with chopsticks and had some wonderful fresh juice too. So why am I posting this here? Well, the court had an interesting payment system. At the entrance is a booth where you buy a prepaid contactless card, much like an Oyster card. Inside the food court – which was big, with lots of stalls – there is no cash. When you buy something, they tap your card and off you go. Fast and convenient. When you leave, you either keep the card for next time or you can return it to the booth for a refund. This seemed very beneficial to the retailers: no cash handling, no wasted counter space, no “shrinkage”, no counting, no security, no bank runs. Why don’t they do this at Glastonbury? Or Westfield? Or in the food court in The Friary in Guildford? Put it in the lease that the retailers have to have contactless terminals and offer a prepaid mall-branded card (like they do at the Trafford Centre, but rechargeable) with special offers. Just a suggestion. 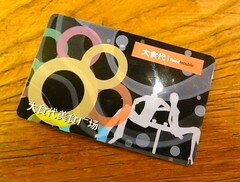 China as a whole is cash-centric, but in Beijing many of the shops and restaurants take cards. I’ve been using my Travelex prepaid Visa card US dollar card while here and I have to say it has worked perfectly so far. Some shops ask for the PIN, some ask for PIN and signature, some ask for signature, but it’s always worked. And it worked in the ATM when I quickly needed to cash for a taxi. I left my credit cards locked up in the room safe and only took cash and prepaid when out and about. Talking about cards, I had an annoying experience yesterday. It was a lovely spring day and the wind had blown away the pollution, so we looked in the guide book and ended up deciding to go for a bike ride (Beijing is very flat). 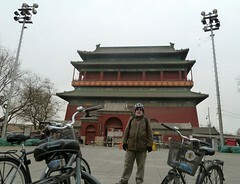 We choose Bike Beijing and booked a tour. When we got there, however, it turned out that they don’t take cards. And I didn’t have enough cash. I was thinking about borrowing one of their bikes to cycle to an ATM when they mentioned that although they don’t take cards, they do take PayPal on their web site. Hurrah! So using my iPhone I logged into their web site and paid with PayPal. Off we went. When I got back to the hotel that night, however, there was an e-mail from PayPal saying that my account had been restricted and that I should log in and change my password, which I duly did. The next day I got an embarrassing e-mail from the nice guys at Bike Beijing saying that PayPal had cancelled the transaction. So I figured, OK, this is some annoying fraud detection system, so I’ll connect via VPN so I don’t look like I’m in China and then sort it out. I logged in and tried to send the guys their money but got “Your account is limited. Please check your Account Overview page for messages about resolving this problem.” In order to remove the limitation, I had to verify my location through my home telephone number (which, of course, I couldn’t do because I was in China and no-one was in at home), so I tried to add my mobile number to the account, but however I typed it in I was told “Mobile Telephone: The phone number is not properly formatted.”, presumably because it’s not in a US format. I gave up. I ended up having to promise the guys at Bike Beijing that I will sort this out when I get back to the UK and then send them their money. I promise I won’t send them a cheque. Sad that PayPal’s iPhone app couldn’t phone home and tell them you’re in China. Wouldn’t have been difficult to implement.